Police officers and firefighters were pelted with bricks, glass bottles cans when violence erupted at a memorial event in Doncaster. 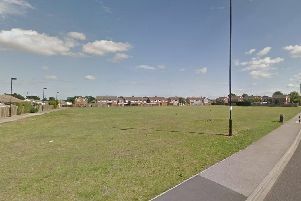 South Yorkshire Police said disorder broke out at an event at The Circle in Moorends, which is known locally as the Bullring, after a number of people gathered to remember a young man from the area following his recent death. The force said the memorial event on Saturday, January 26 initially involved a large gathering of local residents, who met to set off lanterns and pay their respects. But disorder broke out when off-road motorbikes ridden around the streets as a ‘tribute’ as part of the memorial led to complaints about anti-social behaviour and noise. South Yorkshire Police was called and the force said ‘some of the group became hostile towards the police, throwing missiles and surrounding a police car’. The force said a motorbike was torched and when firefighters attended further missiles were thrown. A window of a property was also smashed during the disturbance. In a statement, the force said: “The crowd became hostile and were throwing bricks, glass bottles and cans at officers over a period of time. Four suspects were arrested for violent disorder, with one – a 24-year-old man – later charged. The three others were released under investigation.